North of the town centre, Ipswich School has four parts on three adjacent sites. The Pre-Prep and Nursery were established in 1883 with the aim of preparing children aged 7 to 11 for entry into the Senior School. The Senior School occupies the main school site. The main buildings are a distinctive example of Victorian architecture, with Tudor style brick. The main building and chapel are both Grade II listed. The school buildings surround a central playing field and cricket square along with the Cricket Pavilion. The remainder of the School's sport's fields are located at a nearby site on the edge of the town. The School has a new purpose-built music school, adjacent to the Cricket Pavilion. Within the Senior School the students are divided into three: the Lower School (Years 7 and 8), the Middle School (Years 9-11) and the Sixth Form (Years 12 and 13). The School operates on an independent, fee-charging basis, with a few scholarships and means-tested bursaries. It selects pupils by the use of entrance exams. The School was designated as having a Church of England Religious Character. The school has, however, not chosen to register as having a Religious Charter under the 2009 order. The oldest record that may refer to the school in Ipswich goes back to 1399, in a legal dispute over unpaid fees. The first recorded mention of a grammar school in Ipswich is 1416. The school was most likely set up by the Merchant Guild of Ipswich, which became the Guild of Corpus Christi. The sons of the ruling burgesses were educated for a fee, and the sons of nobility and gentry could attend at higher fees. From 1483 the school moved to a house bequeathed by ex-pupil Richard Felaw, a merchant and politician. His will also provided rental income for the school and stated that, for Ipswich children, only those parents with income over a certain amount should pay fees. In 1528, building work began on an ambitious project for a 'college' school in Ipswich to rival the likes of Eton College. 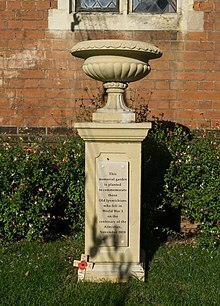 Thomas Wolsey, Cardinal Archbishop of York and Lord Chancellor of England, funded his 'College of St Mary' by ''suppressing' local religious houses such as Rumburgh Priory. Ipswich school was incorporated into the college. Wolsey, who was from Ipswich and may have attended Ipswich school, intended the new institution to be a feeder to his recently built 'Cardinal's College' of Oxford University, which is now known as Christ Church. However, Wolsey fell out of favour with King Henry VIII and the college in Ipswich was demolished in 1530 while still half-built. The school pupils returned to Felaw's house. In 1614 the school moved across the road to the Blackfriar's refectory. During the reign of James I part of the Blackfriars Monastery was appropriated for use as a classroom, and the Blackfriars remained the School's home until 1842 when the building was deemed to be unsafe. For a few years teaching was carried on in temporary premises in Lower Brook Street. In 1851 Prince Albert laid the foundation stone for the School's first purpose-built premises in Henley Road, and by 1852 the new buildings were in use. The School has remained on the Henley Road site ever since. More recently the School has moved away from the traditional full boarding ethos still held by similar schools such as Eton and Harrow. The number of boarding houses has reduced to one and the majority of students are day pupils. The School has flourished under this new approach. The school now has six day houses – Holden, Rigaud, Sherrington, School, Broke and Felaw – into which all pupils are filtered from year 9/Upper 6th Form onwards, and a single large boarding house - Westwood. Those with relatives who attended the school are generally expected to be placed in the same house. There is a good deal of competition between the houses and every year, the houses compete for the Ganzoni Cup (house cup), which is won by gaining points from winning inter-house events. These include most sports as well as others such as debating and art. The final and most important event is Sports Day, in the Summer Term, on which the athletics competitions take place. Felaw has won more times than any other house, with Rigaud in second place; it is believed that School has not won since the days of the reign of Queen Victoria. However, School is the oldest house and dates from the days when the boys lived and were taught in one house (called School House). It later became the boarding house which occupied a part of the main building on Henley Road. The school's single large boarding house is called Westwood. Westwood is no longer a part of the school house system where students were organised into school houses depending on which boarding house they were in. For example, Sherrington House occupied Highwood and, as previously mentioned, School House occupied part of the main Victorian building on Henley Road. Westwood boarding house is now a very multicultural boarding house, including students from Hong Kong, China, Malaysia, Ukraine, Argentina, Russia, Nigeria, Germany, Belgium and the UK - and the mix changes year on year. The School offers a wide selection of sports ranging from the traditional rugby, hockey and cricket, to others such as indoor hockey, sailing and Eton Fives, being one of a handful of schools in the country to have Fives Courts. The School also offers other activities, including the Torino Debating Society, the Dead Poets Society (for A-Level English students) led by Sixth Form pupils, a Sub Aqua Club, Duke of Edinburgh Award and a Combined Cadet Force of which the School has an Army and Royal Air Force section. The School's music department provides several Orchestras, Ensembles and Choirs. Plays are staged every year, in either Great School or Little School. The first recorded cricket match on the school ground was in 1859, when Suffolk played an All-England Eleven. The ground hosted its first Minor Counties Championship match in 1935 when Suffolk played Hertfordshire. To date the ground has hosted 33 Minor Counties Championship matches and 2 MCCA Knockout Trophy matches. The ground has also hosted a single List A match between Suffolk and Kent in the 1966 Gillette Cup. The three main publications are The Ipswichian which is the annual School magazine, The OI Journal which is a publication for Old Ipswichians and The Occasional. The Occasional is the school newspaper published every Monday and written by pupils, and edited by the Communications Manager. It contains articles of note and interest to the members of the school such as sports results and upcoming events. It has recently celebrated its 800th issue and is now in full colour as of the start of the school year 2008. Ipswich School Headmaster, Ian Galbraith, playing his part in the leaving pranks, 2007. Pranks have sometimes been carried out by departing Sixth Formers. 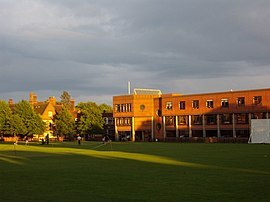 Examples in different years have included: the school's blue gates were temporarily painted pink; a large boat was brought onto the cricket grounds; students hung various banners from the library and there was a sea-themed waterfight; musicians played on the school field while other activities took place such as releasing some farm animals, having an inflatable castle, an ice-cream van, and fancy dress. Sixth Formers now enjoy a Leavers' Day with fancy dress and fun events on the field. Cardinal Thomas Wolsey (c. 1473-1530), statesman under Henry VIII. It must be noted that he endowed, but did not attend, the school. William King (1786-1865), Physician, Philanthropist and pioneer of the cooperative movement. Sir H. Rider Haggard (1856-1925), author of King Solomon's Mines, She and other works. Lieutenant-General Sir Edwin Alderson (1859-1927), first commander Canadian Expeditionary Force in World War I.
Geoffrey Rees-Jones (1914-2004), former Welsh rugby international. ^ "Listed Buildings in Ipswich". Archived from the original on 2011-07-16. Retrieved 2009-10-02. ^ Page, William (1975) 'Houses of Benedictine monks: Priory of Rumburgh', A History of the County of Suffolk: Volume 2, pp. 77-79 (available online). Retrieved 2011-05-02. ^ Gray and Potter (1950). Ipswich School 1400 to 1950. p. 47. ^ "Geoffrey Rees-Jones". The Independent. 2004-09-20. Retrieved 2018-01-22. ^ "Colin Peter Simpson". ESPN scrum. Retrieved 2018-01-22. ^ O'Connell, Kevin (April 18, 2000). "EADT chess column". East Anglian Daily Times. Archant. ^ "Alex Albon | Racing career profile | Driver Database". www.driverdb.com. Retrieved 2018-01-22. John M. Blatchly, A Famous Antient Seed-Plot of Learning - A History of Ipswich School (Ipswich 2003). G.R.W. Webb, The History of Ipswich School and Education in Ipswich (Ipswich 2005). Historic England. "Details from image database (275476)". Images of England.